For millennia, Chinese “junque” sailboats were a symbol of the Chinese coasts. You’ll cruise on an authentic recreation of these tri-sail boats. The luxurious Shogun was designed for an Arab Sheikh and is outfitted with fine teakwood and all the amenities. You’ll cruise along Tenerife’s southern coast, past the cliffs of Los Gigantes, looking for whales and dolphins. 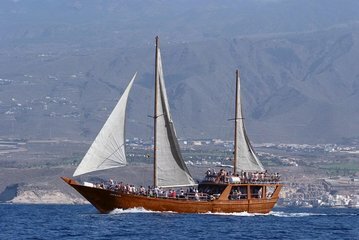 After anchoring in the Bay of Masca, you’ll be invited to swim and enjoy lunch on board.